Sometimes being tiny is terrifying! Violet is a littlish girl with a habit of shrinking into an even littler one. And just like most other normal, non-shrinking girls, Violet really wants a dog. So she decides to join a dog-walking scheme nearby. She and her friend Nisha love playing with their chosen pup – until Violet shocks them all by shrinking to the size of a dog biscuit! All of a sudden, this cute little pooch is VERY BIG. Uh-oh. Can Violet dodge disaster – and save the day when trouble hits at the dog show? Meet Shrinking Violet – and colour her in! 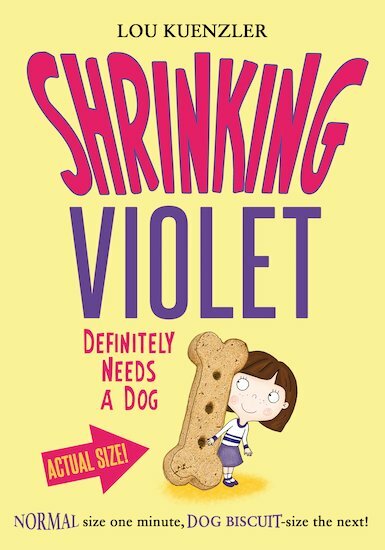 Shrinking Violet is a series about a girl who discovers she can shrink to the size of a biscuit! Download our free puzzle sheet.